"Ethiopia? What's in Ethiopia?" When I mention that I've spent the past ten months living and working in this mountainous country in the Horn of Africa, most people are a bit stumped. 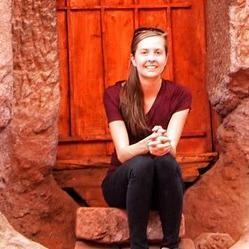 I've been working in the travel trade in Ethiopia, I explain. More quizzical looks. "People travel there?" Perhaps it's easiest to start with what's not in Ethiopia. It's not an iconic East African safari destination with famous big-game parks like its neighbor to the south, Kenya. Never fully colonized, it doesn't have the colonial legacy of its neighbors either. Rather, this vast high-altitude country has charms found nowhere else on the Arican continent, or even the world. It proudly, fiercely protects its own Ethiopian-ness. Sense of place runs strong. For the slowly rising tide of travelers that venture into Ethiopia, this is good news. The country still feels off-the-map and untouched by the forces of globalization. It's full of totally unique experiences, from cultural to geographical to ecological. Here are a few of my favorites. 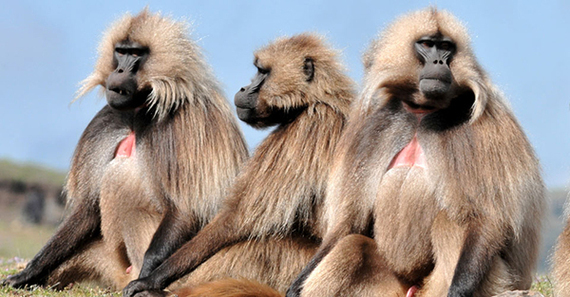 The "bleeding hearts" on the gelada baboons' chests aren't their only photogenic feature. An alpha-male's face has the same intensity as a traditional African mask at a souvenir stand. As far as national cuisines are concerned, I felt lucky to be in Ethiopia. Thanks to the large Ethiopian diaspora that has brought its restaurants to various cities in the U.S. and Europe, many foreigners have sampled "Ethiopian food"--and love it. What's served abroad is only a close facsimile though. There are parts of it that simply cannot be exported. The base of every Ethiopian meal is injera, a huge circle of sour flatbread that the various stews, or wats, are served on. Injera doubles as cutlery to scoop up the wats. 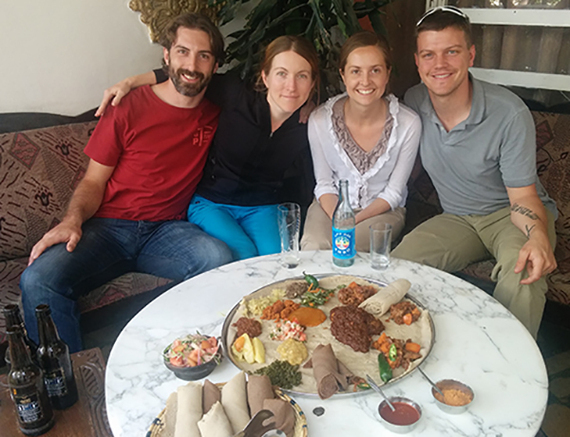 Eating in Ethiopia is always a social, communal affair--one big round plate for everyone to share. 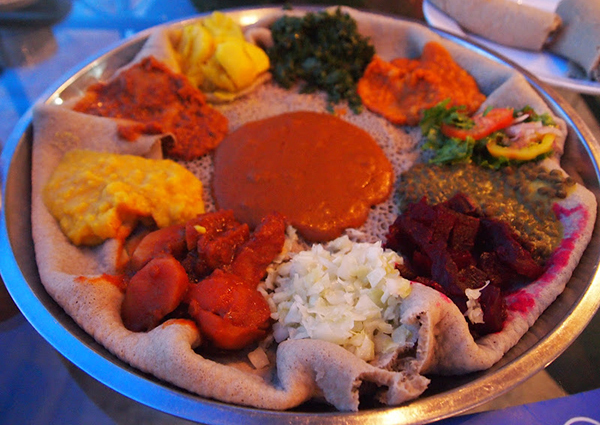 Injera is made of a tiny super-grain called teff that is endemic to the area. Finding pure teff flour, fermenting it, and cooking injera properly is nearly impossible outside Ethiopia. Unless you're in Washington, D.C., where Ethiopian restaurants import freshly-made injera in the cargo area of daily direct flights, you're probably eating a weak substitute cut with a lot of flour. Only in Ethiopia will you find the real deal. Startling facts about the Ethiopian wolf abound. The species is one of the world's most rare canids, with a total population estimated in the mere hundreds. They bear a striking resemblance to North America's copper-colored coyotes. Found only in Ethiopia, their habitats are limited to mountain ranges at altitudes between 9,500 and 14,000 feet above sea level. 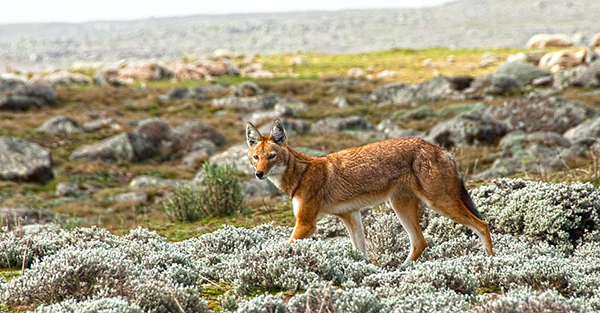 Cattle grazing and human encroachment present real threats for the Ethiopian wolf, even inside the Ethiopia's national parks. By visiting and supporting wolf conservation programs, travelers can help contribute to the vitality of the species. I've seen a lot of expired calendars hanging on walls in my travels. But when I arrived to Ethiopia in 2015, they seemed to have taken it to an extreme. Nothing was more recent than 2008. As it turns out, the wall decor wasn't expired at all. 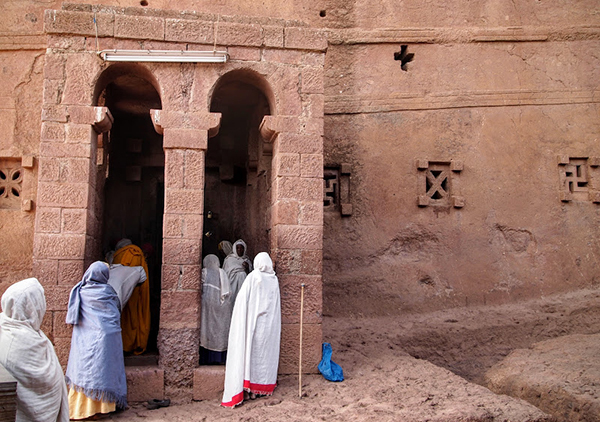 Ethiopia uses its own calendar, following the liturgical year of its own distinct brand of Christianity: Ethiopian Orthodox. A hybrid of the Egyptian and Julian calendars, the Ethiopic calendar handles leap years in such a way that it's consistently seven to eight years behind our own Gregorian calendar. Ethiopians ring in their new year on September 11 or 12. The differing calendars causes no end of confusion for ferengi, or foreigners. 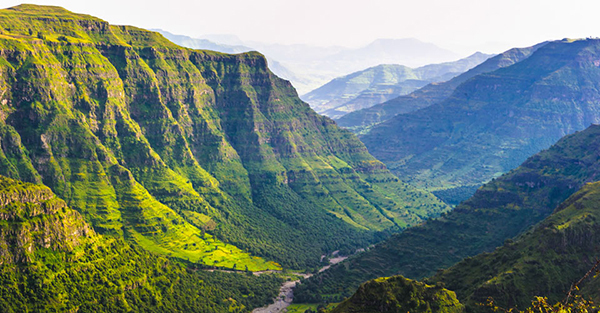 On the bright side, it's a good source of cheesy tourism taglines like "Feel seven years younger in Ethiopia!" Hailing from Denver, Colorado, I come from a state obsessed with altitude. We pride ourselves on the number of peaks we've summited that are over 14,000 feet (Colorado has 54 of these "14ers"). Naturally, I was delighted to discover that ruggedly mountainous Ethiopia has its own towering peaks for me to add to my "14er" collection. The Sanetti Plateau in Bale Mountains National Park, for example, reaches over 14,000 feet. Accessible by 4WD vehicle, the challenge isn't getting there. The hard part is staying warm at the chilly, wind-whipped top. 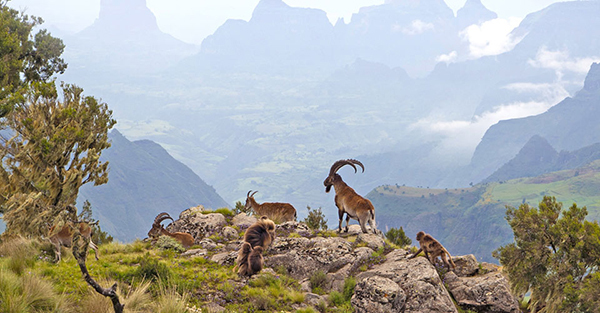 The summit of Abuna Yosef, near Lalibela, is only reachable on foot and measures up to just over 14,000 feet. No, hipsters have not overrun Addis Ababa, Ethiopia's capital city. The coffee culture here is a before-it-was-cool combination of deep tradition and Italian influence during its brief occupation in the 1930s. As the birthplace of the coffee plant and a huge producer of the magic bean, Ethiopia consumes coffee as enthusiastically as it exports it. 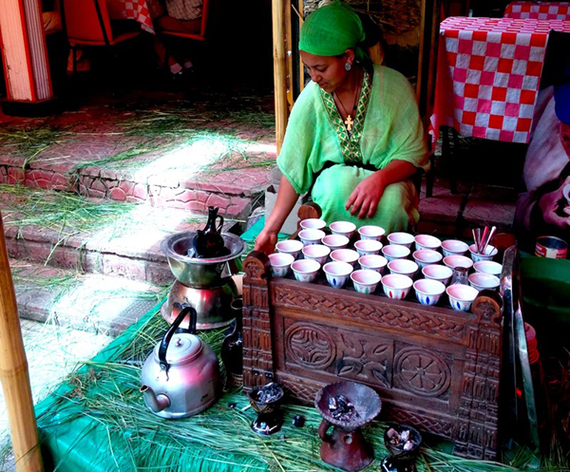 Traditional coffee, or bunna, is brewed in a clay pot over coals in the context of a beautiful incense-scented ceremony. In bare-bones cafes with little else, you'll find Italian-style espresso machines whipping up impressive macchiatos at local price levels (around U.S. $0.50). Vegans can request a version made with powdered soy milk. This is not a diet trend or statement; it's part of strict religious dietary codes that Orthodox Ethiopians follow. Just be sure to call it "fasting" and not "vegan."